Since Google AdWords is an expensive ad platform and its cost-per-click (CPC) advertising rate is sometimes shocking high for hot keywords. Startups like us are unable to compete with big companies who can afford to spend well over six figures per month on an AdWords campaign. In addition, we're not directly selling goods or service but just want to grow our fans on social networks and ultimately expand our online presence in the industry. Facebook promotion, no doubtedly, is our first choice. Promoting a post on Facebook is extremely easy to start with. 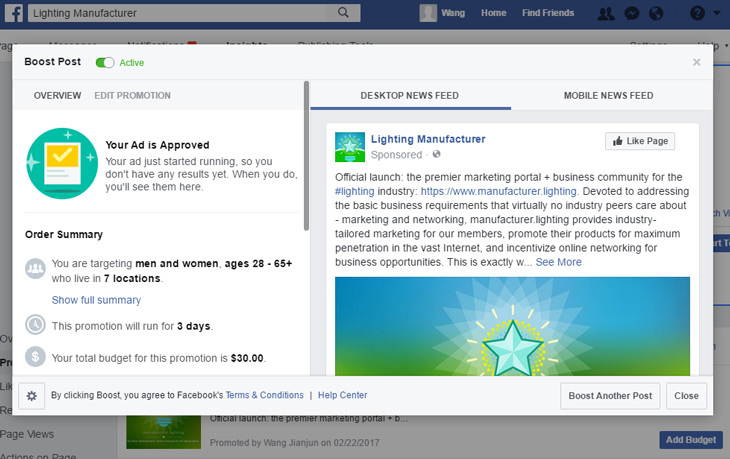 Click the Boost Post button in the bottom right-hand corner and it will lead you to the ad configuration panel where you can choose your audience based on locations, ages, genders and interests. I chose seven countries with more stable economies and more HVCs (high-value customers) - United States, United Kingdom, Germany, Canada, Denmark, France and Sweden. The audience's interests were refined to lighting and related topics, e.g., lighting designers, lighting technicians. The total budget was set to $30.00, with an estimated number of 2700-7200 people reached. This is a pretty good CPP (cost per point) when compared with Google AdWords campaigns. The payment method is very flexible for advertisers from China. You can choose from credit or debit card, PayPal and Alipay. I made the payment with PayPal. Within a few minutes the ad was approved and is running now. Fingers crossed. Just want to see what's working and not working on my campaign and if there's any engagement with my post to make decisions about the best ways to connect with our audience. Will keep you informed with the result. The average cost per like is $0.43 for this campaign. What this means is that if you spend just one dollar per day on Facebook ads, you'll get 848 likes and appear in front of 14,500 people. If you are taking advantage of that and your competitors do not care, you'll not only benefit from low ad cost because of low competition and more importantly win the awareness game in your niche. Yeh! The early bird gets the worm. 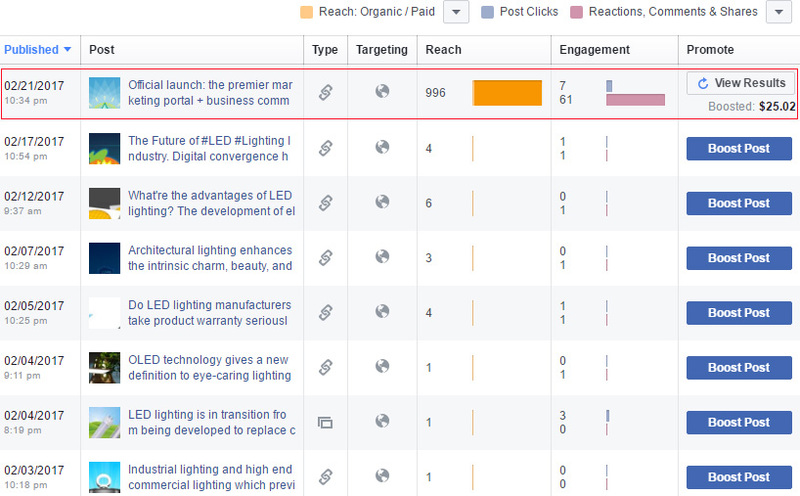 That being said linkedin might have a more targeted audience than Fackbook in terms of B2B interaction. I did have a look into the linkedin ads and found their cost-per-click (CPC) is very high. Although Facebook likes do not equal website or post clicks, its cost-competitive CPM program definitely worths a good research. If the post is optimized to a level that is highly soliciting to your audience, the small investment will boom and burst the business interaction between you and your clients.